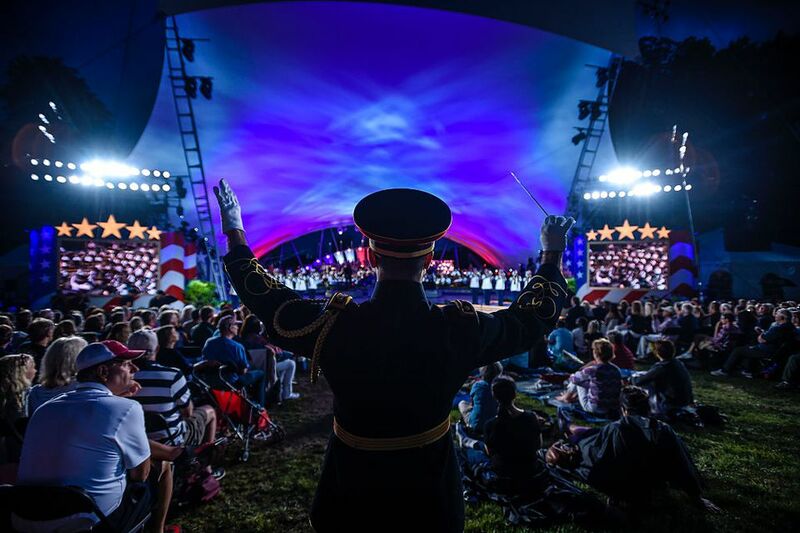 The nation’s premier Independence Day holiday concert features performances from some of the country’s best known and award-winning musical artists accompanied by the National Symphony Orchestra. The Capitol Fourth concert and show includes an evening of patriotic and uplifting music followed by a spectacular display of fireworks over the Washington Monument. The annual event will be broadcast live on WETA TV 26 with a repeat airing at 10:00 p.m, and it will also be live-streamed on PBS.org, YouTube and Facebook. This year, John Stamos returns to host the show from the the West Lawn of the U.S. Capitol. Perfomers include the Beach Boys, Jimmy Buffet, classical singer Renée Fleming, violinist Joshua Bell, legendary Motown act The Temptations, pop group Pentatonix, country singer Luke Combs, gospel legend CeCe Winans, Broadway icon Chita Rivera, and the National Symphony Orchestra under the direction of top pops conductor Jack Everly. The Choral Arts Society of Washington, the U.S. Army Herald Trumpets, the U.S. Army Ceremonial Band, Members of the Armed Forces carrying the State and Territorial Flags and the Armed Forces Color Guard provided by the Military District of Washington, D.C. will also perform. Where: Access to the concert is located at the southwest corner of the Capitol grounds. The best way to get to the Capitol is to take the Metro, and the closest stations include Capitol South, Federal Center SW, and Union Station. Admittance to the West Lawn of the U.S. Capitol will begin at 3 p.m., but the concert does not start until 8 p.m. and the firework show will not begin until at least 9:30 p.m..
Keep in mind that getting to the National Mall on Independence Day can be slightly tricky as some road closures, train delays, and blocked routes may occur in preparation for celebrations across the city. There are other events on the National Mall for the 4th of July that you can check out as well. Tickets: No tickets are necessary for this free concert, which is open to the public. When: The concert broadcast begins at 8 p.m. and concludes at 9:30 p.m. Concergoers will get there much earlier than the start date in order to snag a good spot to see the show. The gates are located at the southwest corner of the Capitol grounds, and the gates typically open at 3 p.m. No one will be admitted to the West Lawn of the Capitol before then, and guests are required to enter through a metal detector. What to bring: You will be allowed to bring food and drink to the concert, but alcohol is prohibited. You're also allowed to bring camera and video equipment, but you are not allowed to publish, distribute or sell any photographs or video. Facilities and Amenities: Portable toilets will be available on site. Hotels near the Capitol include Holiday Inn Capitol, The Liaison Capitol Hill, W Hotel - Washington DC, and many more. Click here to see a list of over 20 hotels in Washington DC. For a bite to eat, consider walking to Pennsylvania Avenue on Capitol Hill for dining options like Southern restaurant Art & Soul. Here's a list of restaurants on Capitol Hill. Or you could walk to Chinatown and dine at any number of the restaurants along "Restaurant Row."